Turtle Races may seem sort of strange, but it has been a part of our community for nearly 40 years! It’s just second nature to us. This family-friendly event attracts thousands of racers from all over the world each summer. It is an experience that you won’t want to miss! Here are some of the most frequently asked ones to get you started. If you have more, feel free to give us a call at (218) 346-7710. What time do the races start? Registration begins at 10:00am. The races start at 10:30am. Where are the races held? 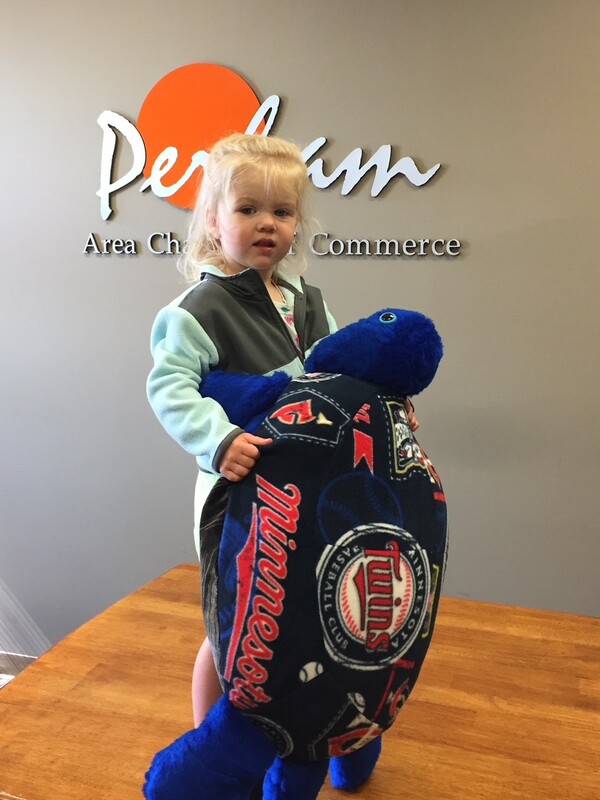 They are held in Turtle Race Park, next to the Perham Area Chamber at 185 East Main Street in Perham. How do the turtle races work? The racers gather in the center circle and release their turtles when the whistle blows. We all watch while the turtles make their way to the outer circle. The first turtle to the outside ring wins! The heat winners are then gathered to race again until we have the top three places. How old (or young) do you have to be to participate? Anyone can race as long as they can get to the center of the track! We encourage racers of all ages, and we have volunteers available to help if you are unable (or a feeling a bit too jumpy) to hold onto the turtle. How much does it cost? We ask for a $1 donation per racer. The proceeds are used to take care of the turtles over the summer. Are turtles provided? Yes, we have turtles available for use. A family takes care of them all summer and brings them to town for us each week. Can I bring my own turtle? Absolutely! If you have been training a turtle for the races, we’d love to see what he or she can do. Just bring your turtle in a bucket so it doesn’t get away from you! Are other pets allowed? Please, no pets other than turtles allowed in the park during the races. How long do the races take? Each individual race takes a few minutes. Depending on how many people we have, the races can last an hour to two hours. Why are they called the International Turtle Races? We call it International because people from all over the world join us to race turtles. 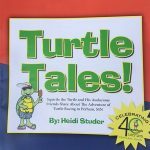 Squirtle the Turtle and his audacious friends share the adventures of Perham’s International Turtle Races over the past 40 years in the “tell-tale” book Turtle Tales. Books are available for $10 every Wednesday morning during turtle races. For every book sold, $5 is donated to the HOTL Elementary School. 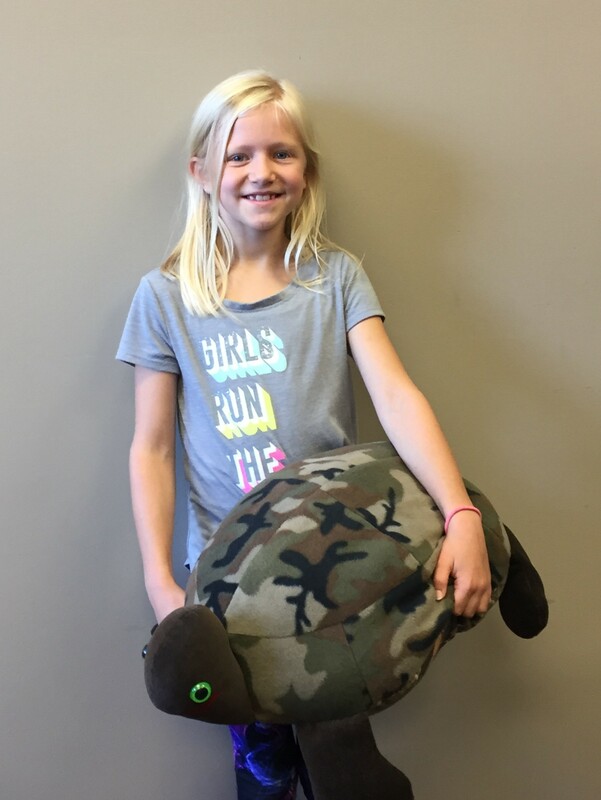 Congratulations to Grace and Rory our summer 2018 winners of “Tory the Turtle”! Week Thirteen (August 29, 2018) Winners – Announcer Dave Howey from Lakes 99.5 and Miss Heart of the Lakes Outstanding Teen, Ashleigh Kruse, are shown with our First Place winner, Natalie Bilbich from New York Mills, MN, Second Place winner, Avaliee Brown from New York Mills, MN, and Third Place winner, Estelle Martodam from Perham, MN. A big thank you to all who joined us today for the last race of the season! 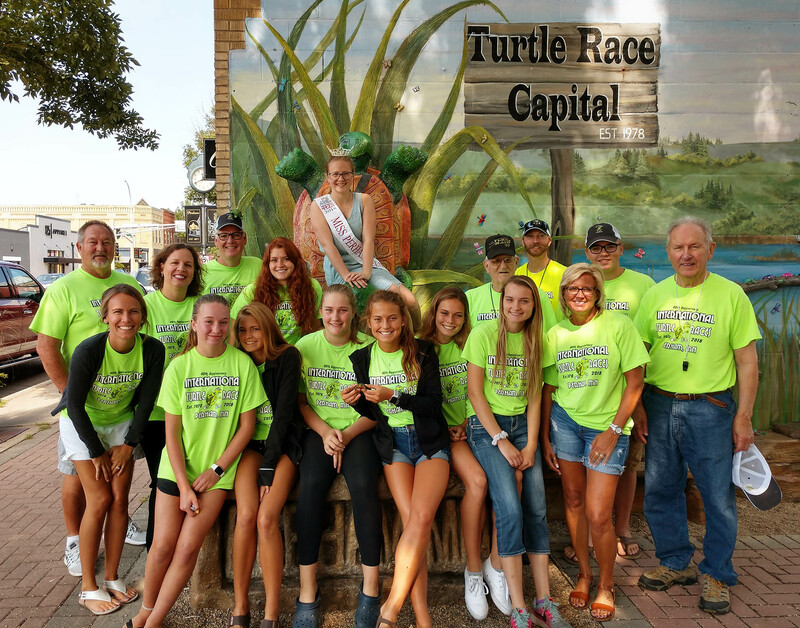 Week Twelve (August 22, 2018) Winners – Announcer Dave Howey from Lakes 99.5, Miss Perham – Cassidy Nelson, Miss Perham Outstanding Teen – Lizzy LaFond, Miss Heart of the Lakes Outstanding Teen – Ashleigh Kruse and Miss Turtle Fest Outstanding Teen – Sophie Nelson are shown with our First Place winner, Toby Bassett from Brainerd, MN, Second Place winner, Nia Borg from Bemidji, MN, and Third Place winner, Hennessy Momberg from Fairbault, MN. A big thank you to all who joined us today! Week Eleven (August 15, 2018) Winners – Announcer Dave Howey from Lakes 99.5 and Miss Perham Outstanding Teen, Hannah Beck are shown with our First Place winner, Kristie Kirsch from Fargo, ND, Second Place winner, Luke Reimer from Mankato, MN, and Third Place winner, Reed Cummiskey from Coralville, IA. A big thank you to all who joined us today! 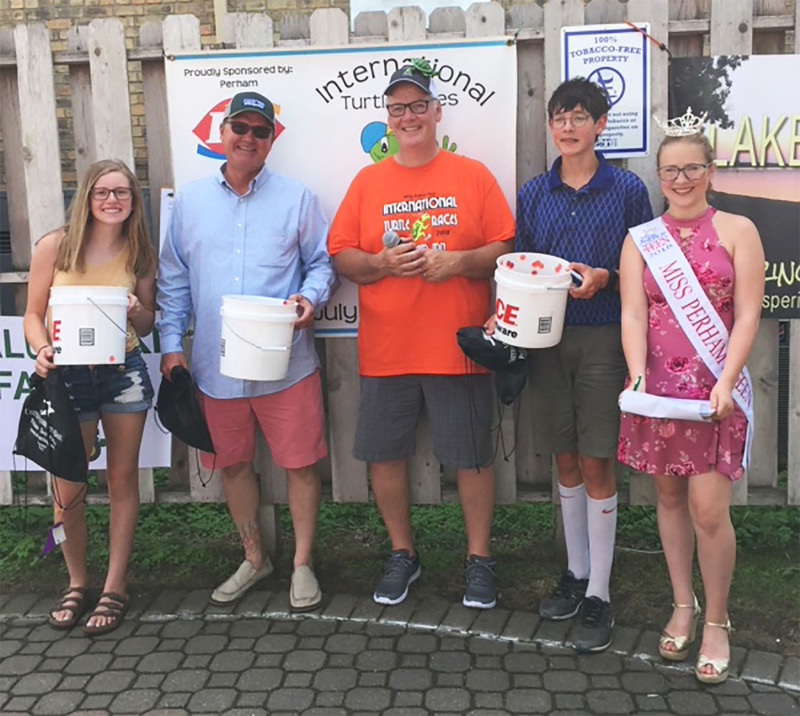 Week Ten (August 8, 2018) Winners – Announcer Dave Howey from Lakes 99.5 and Miss Perham Outstanding Teen, Hannah Beck are shown with our First Place winner, Elliot Davies, Second Place winner, Addie Berndt, and Third Place winner, Joel Ostrom. A big thank you to all who joined us today! 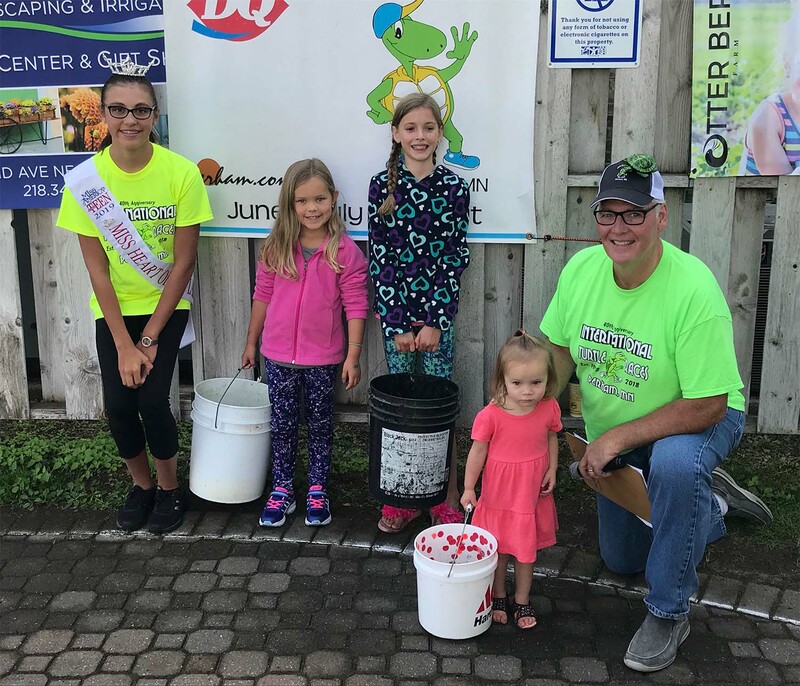 Week Nine (August 1, 2018) Winners – Announcer Dave Howey from Lakes 99.5 and Miss Perham Outstanding Teen, Hannah Beck are shown with our First Place winner, Jelyn Lease, Second Place winner, Piper Bjorkland, and Ellie VanHeel. A big thank you to all who joined us today! Week Eight (July 25, 2018) Winners – Announcer Dave Howey from Lakes 99.5 and Miss Perham Outstanding Teen, Hannah Beck are shown with our First Place winner, Jacy Slipper from Detroit Lakes, MN, Second Place winner, Juliette Zimmerli from Austin, MN, and Dylan Barker from Detroit Lakes, MN. A big thank you to all who joined us today! 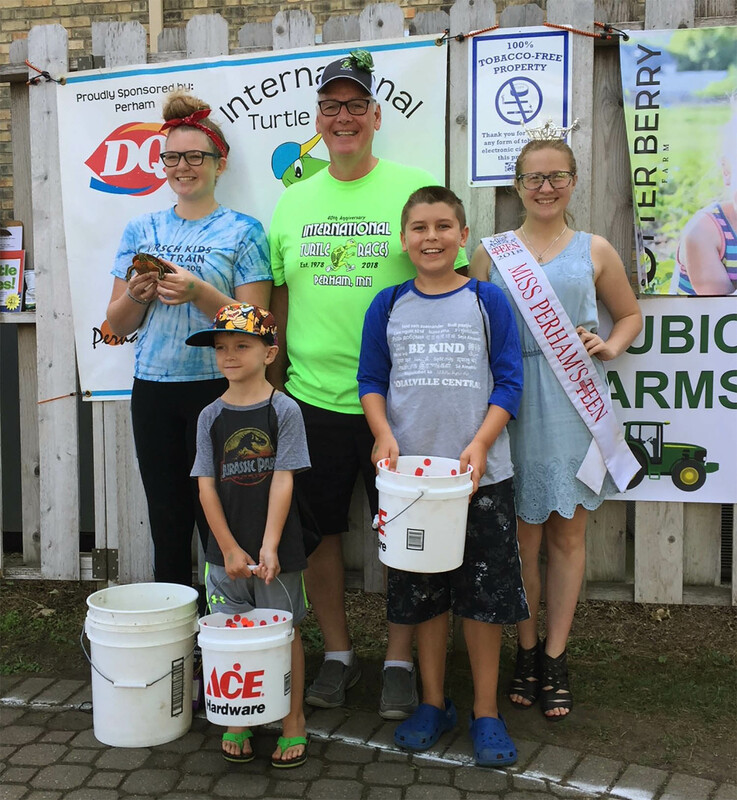 Week Seven (July 18, 2018) Winners – Announcer Dave Howey from Lakes 99.5 and Miss Perham Outstanding Teen, Hannah Beck are shown with our First Place winner, Kevin White, (Mazeppa, MN), Second Place winner, Tesa Federovich, (Annandale, MN), and Brynley Nowach, (Sioux Falls, SD). A big thank you to all who joined us today! Week Six (July 11, 2018) Winners – Announcer Dave Howey from Lakes 99.5 and Miss Perham Outstanding Teen, Hannah Beck are shown with our First Place winner, Ava Sullivan, (Farmington, MN), Joe McCarthy, (Phoenix, AZ) and Samuel Dekleva, (North Platte, NE). A big thank you to all who joined us today! 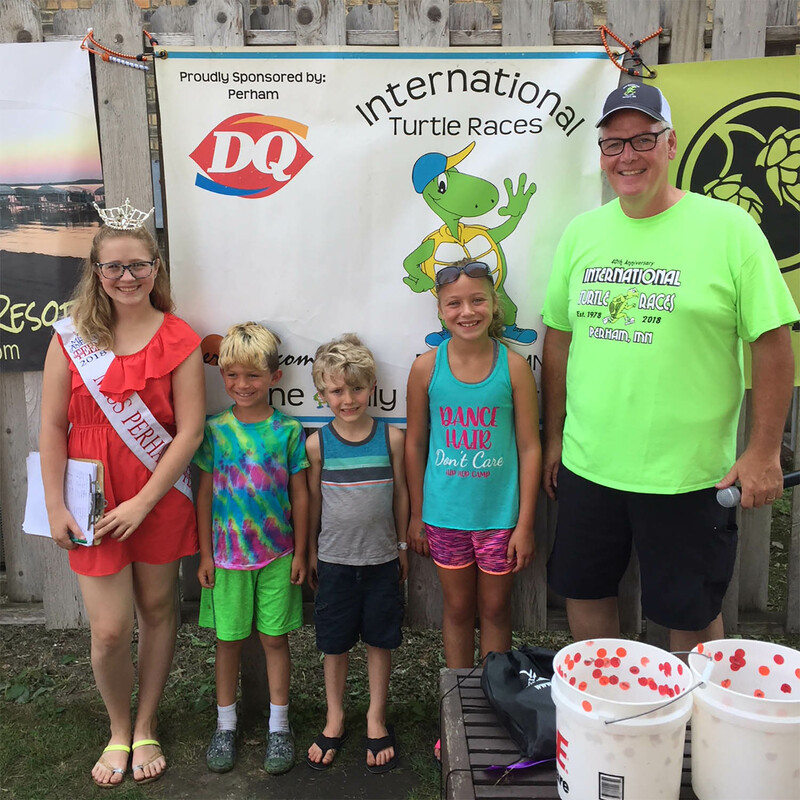 Week Five (July 4, 2018) Winners- Announcer Dave Howey from Lakes 99.5 is shown with today’s First Place Turtle Race winner, Joselyn Lind (Pappillion, NE), Second Place winner, McCoy Ferguson (Mapleton, ND), and Third Place winner, Tristan Burkman (Perham, MN). A big thank you to all who joined us today! Week Four (June 27, 2018) Winners- Announcer Dave Howey from Lakes 99.5 and Miss Perham Outstanding Teen, Hannah Beck are shown with our First Place winner, Soren Stout (New York Mills, MN), Second Place winner, Avalee Brown (New York Mills, MN), and Third Place winner, Zea Gonshorowski (Portland, OR). A big thank you to all who joined us today! Week Three (June 20, 2018) Winners – Announcer Dave Howey from Lakes 99.5 is shown with our First Place winner, Kaitlyn Sautter (New York Mills, MN), Second Place winner, Isaiah Pollard (Ottertail, MN), and Third Place winner, Trevor Munoz (Mason City, Iowa). A big thank you to all who joined us today! 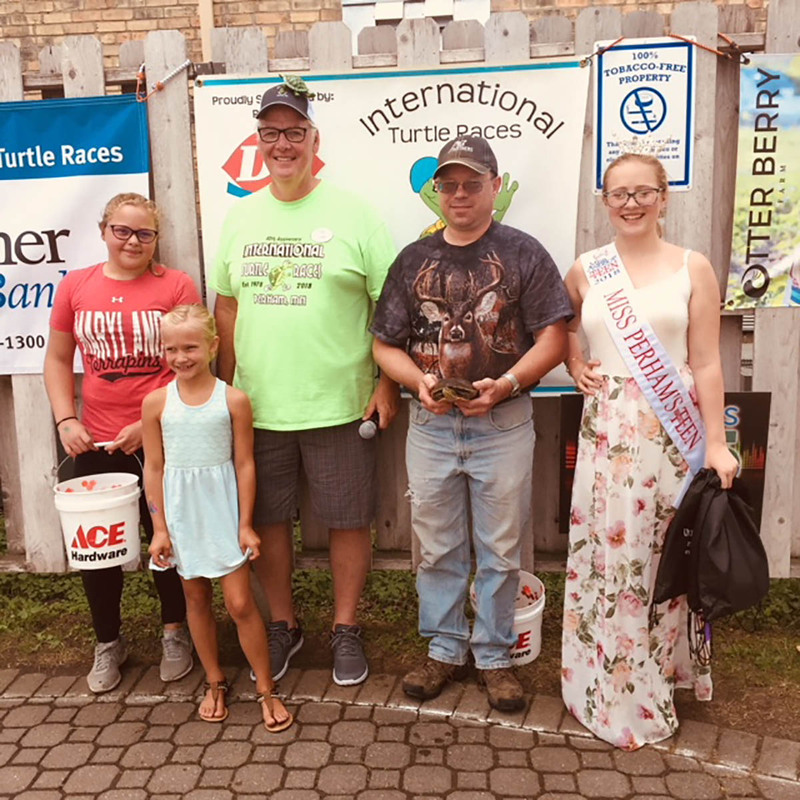 Friday, June 15, 2018 (Turtle Fest) Winners – Announcer Dave Howey from Lakes 99.5 is shown with our First Place winner, Joe Riepe (Eau Claire, WI), Second Place winner, Kailey Klinder (Mankato, MN), and Third Place winner, Miller Sebastian (Merced, CA). A big thank you to all who joined us today for our special, Friday Turtle Fest race! Week Two (June 13, 2018) Winners – Announcer Dave Howey from Lakes 99.5 is shown with our First Place winner, Kaia Deckard from St. Paul, Second Place winner, Logan Staeheli from St. Paul, and Third Place winner, Kalum Kneisl from New York Mills. A big thank you to all who joined us today! Week One (June 6, 2018) Winners – Announcer Dave Howey from Lakes 99.5 and Miss Perham Outstanding Teen, Hannah Beck are shown with our First Place winner, Nathan Becker from Lincoln, Nebraska, Second Place winner, Hunter Van Hoozer from Nebraska, and Third Place winner, Samantha Baumann from Oklahoma. A big thank you to all who joined us for the first Turtle Race of the 2018 season!